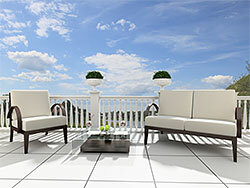 Outdoor living is about making the best use of all the open areas on your property and decks & patios are now becoming a fixture in almost every home in and around San Fernando, Santa Clarita, Simi Valley. These features add a dimension to your property, improve its functionality and give you spaces that you can relax and entertain in. This is a very good option for construction of decks & patios. It is durable and long-lasting and as long as it has been installed with control joints and with the best materials, it will not crack in extreme temperatures. Concrete deck surfaces can also be stamped and etched or polished for the kind of texture you want and are available in a range of colors too. This is an extremely versatile material and we handle its installation in an expert manner. This is another all-time favorite material for decks & patios. Regardless of the number of different materials that are launched in the market, there is something special about wood which makes a number of homeowners opt for it in the construction of their decks & patios. There are different wood species that you can choose from and it adds a very distinctive and elegant look to your home. Wood is a much more expensive option compared to concrete, but it is long lasting. It will require regular staining and sealing and it can last for years without trouble. You can choose between hardwoods such as ironbark, redwood, cedar and redgum and tallow wood, spotted gum and mahogany are considered to be some of the most-durable and sturdy hardwood options for decks & patios. Wood is aesthetically appealing, adds value to your property is durable and eco-friendly. This material is a mix of plastic & recycled wood scraps and this makes it an eco-friendly material. It is available in a range of colors and can complement any type of décor. It is also available in a range of wood finishes and so you can get the look of wood without the maintenance hassles. 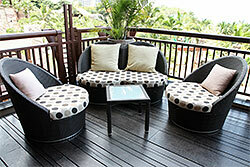 Many composite wood decking manufacturers make this material with wood grain texture molds. 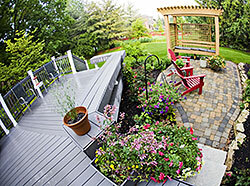 We can install decks & patios of different styling and of the material you choose. We use the highest grade materials and all the installation work is handled by expert personnel within a very realistic budget. If you have a design idea, we can work on it. Contact California Creations us via this online form or on 818-083-1213, in Sylmar, CA for all your decks & patios needs.